It ain't quite the French Laundry, but that's the closest I could get to this time! 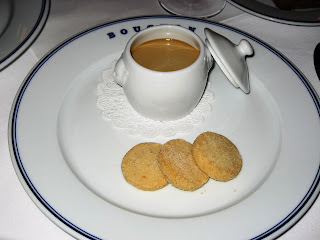 Like the original bouchons of Lyon after which it was modeled, world-renowned chef Thomas Keller's Bouchon serves an award-winning menu of bistro classics and daily specials, featuring the best seasonal products available. 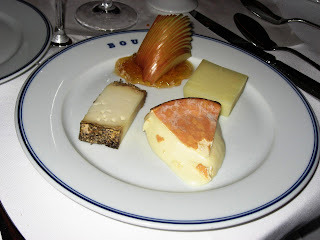 Located in the Venezia tower of the Venetian in Las Vegas, Bouchon is quite clearly the top ranking restaurant in this resort-hotel. The restaurant's exquisite decor is the perfect setting for its award-winning culinary delights. 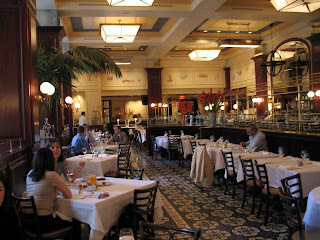 Soaring ceiling, potted plants, close tables, dark-wood furniture, and Parisian murals, together result in a great ambiance. The menu was interesting: printed on a thin sheet of paper that was folded around the napkins. I chose their specials for today: Sweet carrot soup followed by an entree of roast leg of lamb, thinly sliced and served on a bed on greens, peppers and lamb jus. For dessert I ordered the coffee infused custard. 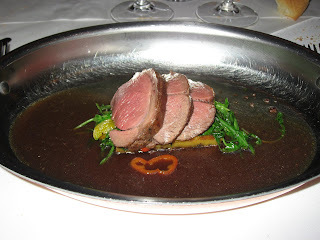 The Pinot Noir went splendidly with my lamb entree; actually, the lamb was so good, it would have been great by itself. The dessert too was smooth and creamy and a fitting end to a great meal. 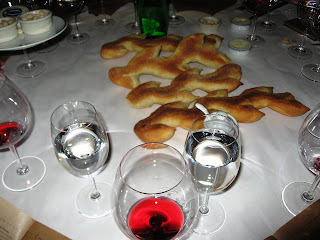 The Spanish dessert wine our waiter recommended was very good too! I think the sauteed scallops which some of my dinner companions turned out fine as did the cheese plattter. All in all a great evening! Everything I ate, I liked very much. The service lived up to its reputation; the waitstaff was knowledgeable, friendly and fast. Incidentally, this bistro has a great oyster bar too if you are so inclined, and they also serve a first-class breakfast in the mornings. Arg! The one restaurant in the Ventian I didn't try has that cheese?!? I guess it's a good excuse get thee back to Vegas! one of the restaurant that im sying to go.. you travelled a lot ! What a lovely and decadent place and you've described it and documented it so well. I really wanna go there one day as I love the food available. 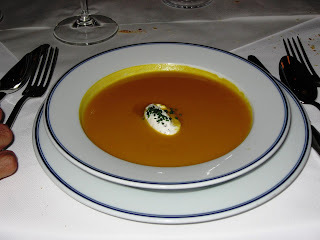 The Sweet carrot soup and entree of roast leg of lamb looks deliciously good - my mouth is watering - thanks for sharing! Looks divine. The FL slipped to 5 in this year's top 100 anyway! @azazura: Good to see you back here. @rennyba: It was as good as it looks. @beaverboosh: Really? Need to find which list that was. Of course, Restaurant magazine's list put Alinea at the top even last year.